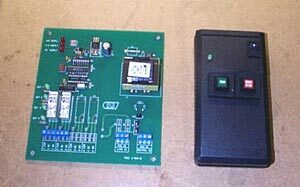 The 2 button system can control your smaller equipment or operational needs. Our 2 button system consists of a Transmitter and a Receiver unit, all cabling, antenna and a wiring diagram for easy hookup. As with all of our products, we will build, design and program each system to your equipment needs and operational requirements. Below is a list of some of the capabilities of our Remote Control Systems. If it is not on the list, Please call us to evaluate and discuss your specific needs! 1 button E stops systems also available! Mountain Technologies, 2701 Rosehill Street, Boise, ID 83705. Tel: 208-388-1083; Fax: 208-331-8354.